I have a single form with a Tab Control containing 4 tabs with list boxes on 2 tabs. I have navigation tabs on the first tab and it controls all the tabs. The list boxes contains different data. I want the navigation tabs to work only in tabs 1 and 2 but a second navigation tab to work on tabs, 3 and 4. I would love to help, but your description is a bit confusing. I know what a Tab Control is, but what do you mean by "navigation tabs"? Is this within the confines of a Navigation Form? Any additional information you can provide would help guide us to a solution. It is the Navigation Buttons that starts with First Back Next Last New to create or edit records. At this point, I have no idea whatsoever what you are talkling about. There are Navigation Forms--which is a type of form) and there are Navigation Controls that can be displayed on your ordinary forms. 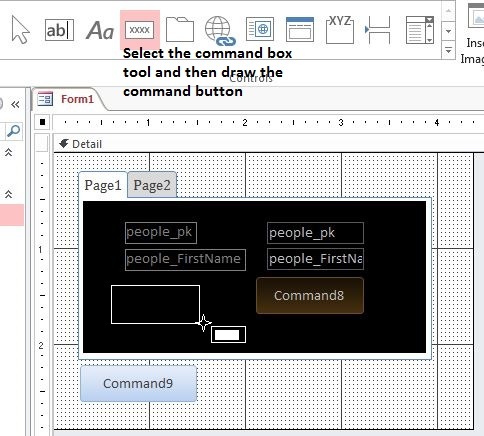 You can also create Command buttons that perform the same functions as the Navigation Controls. However, you still haven't explained anything about the navigation buttons/tabs/controls being on the first tab of your Tab Control, nor what you are really trying to do. You have to give us ample information if you want any type of assistance on this forum. Or anywhere. That's the point. We don't demand you work for your supper. We merely request the most basic understanding of what you're trying to ask about. No-one anywhere can help you unless you express what it is you want help with. We're not here to demonstrate psychic abilities. Open your form... windows 7 and newer has the Snipping tool, use that tool to capture an image of your form. please don't use links to third-party image sites as these are often blocked by company firewalls - upload image from your PC to the site. In this case, a picture will be worth a thousand words! It directs the images I have on the different tabs. I want the navigation tabs to work only for 1 and 2 tabs and a second button to control tabs 3 and 4 but a second navigation tab to work on tabs, 3 and 4. I want the navigation tabs to work only for 1 and 2 tabs and a second button to control tabs 3 and 4 but a second navigation tab to work on tabs, 3 and 4. Please explain what you mean, as you have mentioned this before and it didn’t make sense either. Your picture, although it might have helped, now adds more confusion, because you have now shown us TWO sets of navigation buttons. Please provide more details of what you are trying to do, not just repeating what we don’t understand. While I appreciate the effort to provide only the pertinent parts of your form - what I asked you for was a FULL capture of your form so that we can see what you have done. Also do you understand what the main intent of the TabControl was originally designed for? 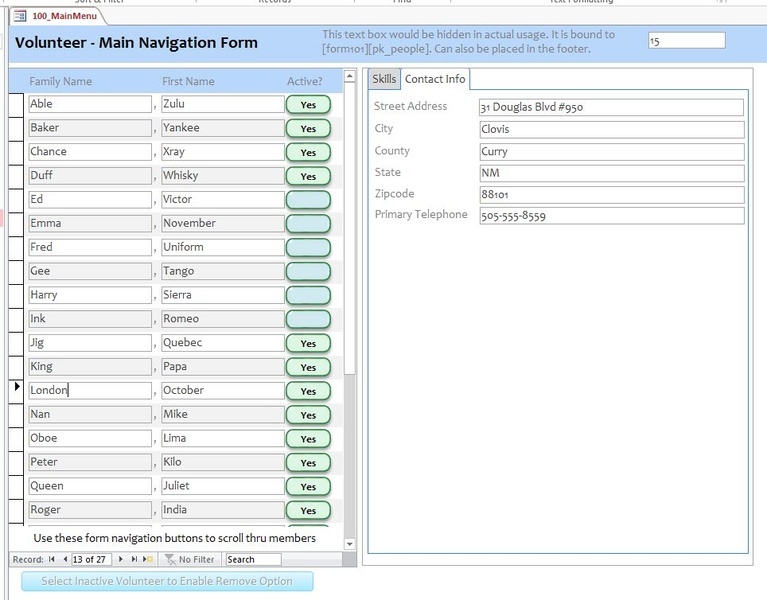 Are you using subforms within your TabControl? and then perform a set of actions depending on the active page. You can get a bit more granular by naming the tab-pages and calling them directly... FMSINC has a nice tutorial and a sample database that shows this code. I further suspect that the native record controls need to be hidden; however, without the full form image capture it's impossible to tell. BTW As FMS Inc is a web page provided by another Access MVP (My friend and colleague Luke Chung) I believe that linking to there is acceptable. I hope this image will help. As I said before, I want the navigation tabs to work only for 1 and 2 tabs and a second button to control tabs 3 and 4.but a second navigation tab to work on tabs, 3 and 4. Apparently we are not making ourselves clear enough. Your description still does not make any sense. The first few times you said the same thing, and we still don’t understand. Perhaps describe it differently, rather than saying the same thing and assuming we will somehow figure out what you mean. What are “navigation tabs”?? If all your tabs are linked to the same set of records, then it doesn’t matter, and navigation will affect all tabs. Is this “button” the same as your “navigation tabs”? Consistent language is not just helpful, it is a necessarily when working on a forum like this. Concerning just tabs 3 & 4, see above. but a second navigation tab to work on tabs, 3 and 4. Is this a typo? Is this something different than your “second button”? Is this another control? What is a “navigation tab”? I hope you can appreciate the immense level of patience many of the experts on this forum have already exercised with this thread. Believe it or not, we really do want to help you. However, every time we ask for additional details, you never answer our questions directly and seem to only restate what you have already stated. We cannot help you if you don’t provide us meaningful descriptions of what we ask for. Unlike Neopa, I am psychic ( well partially). I think what ijared wants is to show his custom command buttons for "First", "Next", "Back" & "Last" only when Pages 1 and 2 of his Tab control are active. I am not psychic enough to understand on which pages he wants to display "Delete" & "New"
"but a second navigation tab to work on tabs, 3 and 4." eludes me completely. If, ijared, when you reply, please use the correct terms, and then we will be able to help. At the bottom of your form you have 6 Command Buttons:- "First", "Next", "Back", "Last", "Delete" & "New"
Sorry for the disturbance it is taking. The navigation tabs are the 6 Command Buttons:- "First", "Next", "Back", "Last", "Delete" & "New" showing in the picture and I understand that the navigation will affect all tabs. I waant it to affect only the first 2 tabs so the 3 and 4 tabs will not be affected. The last tab says No Longer Volunteer. It's just a title. I want it to affect only the first 2 tabs so the 3 and 4 tabs will not be affected. In that case convert the code to use the VBA objects rather than the DoCmd macro commands. It does mean you'll have to issue each command for both Pages though. There are no Tabs. Tab Controls have Pages, not Tabs. This all assumes the forms are not related or linked. I do think the long pole in the tent is the records behind the tab control in the first place. Based on the description so far, the navigation controls on the form already affect all the pages in the tab control. If this is the case, then I don’t know how to change the record on pages 1 and 2, and maintain the same record on tabs 3 and 4. Wouldn’t this require a restructure of the tab control to include sub forms on each page? Probably. Hard to know unless we're told though. I'm sorry ijared. Unless you use the correct terms we are going to struggle. You correctly refer to command buttons one moment, and then refer to them as tabs. Very confusing. If you select a control with your cursor, you will find it's correct Selection Type in the properties window. Please ONLY use those terms. Here are some images of forms, and those images in design view, I have indicated where to will find the correct type of control. This is a Tab control. In form view these are some of the form's components. I suggest that you refer to the things at the bottom of your form as Navigation Command Buttons, and at the top of your form you have a Tab Control with four Pages on it. Thanks a lot. It is taking me some times to wrap my head around these names and the way you call them. On the first page I have a list box and I may have to move the name to the list box on the third page. I will have to leave the command buttons the way they are. I have a single form with a Tab Control containing 4 Pages with list boxes on 2 of the Pages. I have navigation Command Button on the Page 1, and it controls all the Records?????. The list boxes contains different data. I want the navigation Control Buttons to work only on Pages 1 and 2 but a second navigation Button to work on Pages 3 and 4. So please confirm I am correct. If so, please confirm that you want an set of navigation Control Buttons on Page 2, identical to those on Page 1. Precisely what do you want on Pages 3 and 4? I thought the answer I asked for was finished. I stand by what I said from the begining and yes, the navigation Control Buttons are for changing records, NOT for changing Pages. I want an set of navigation Control Buttons on Page 2, identical to those on Page 1. On Pages 3 and 4, I only want the record selected in list box1 is moved to list box 2. I don't see how this is possible without hte use of sub-forms, which you have given us no indication this is what you have. list boxes do not contain records--they contain lists. Additoinally, this has nothing to do with the navigation command buttons/controls on the pages we have been talking about. Please, take some time and thoroughly explain what it is you want to do. We are willing to help. If I gather correctly, you want a command button that will move a selected item from one listbox to another listbox. What's throwing everyone off is that we are trying to use the official terminology that Microsoft uses but you're taking some of the terminology and applying it elsewhere. The problem with that is we have no idea what you're referring to because we only know of one type of navigation controls. What you're referring to as navigation controls are not navigation controls. And what you're trying to do with the new set of controls has nothing to do with "navigation" in the context in which Microsoft uses the phrase navigation controls. If we've answered your question then you need to let us know so that we can move on to someone that needs our help. I stand by what I said from the begining and yes, the navigation Control Buttons are for changing records, NOT for changing Pages. ... and from the beginning you have been somewhat ambiguous in your terminology by refusing to use the correct nomenclature for the control objects in question. At least in post #7 the image started us on the correct path and finally in Post #11 you showed us most of your form... you missed the very bottom where the form's default record navigation buttons are located. I want an set of navigation Control Buttons on Page 2, identical to those on Page 1. This is easy enough to accomplish and I have attached a database that has a very generic form that shows this. 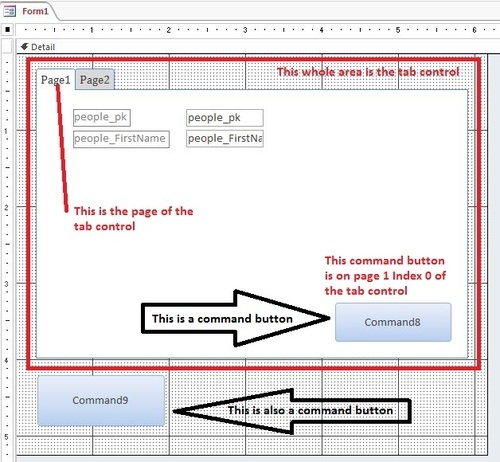 To get the control button on the PAGE of the tab control you have to select the page not the form and then add your controls to the page. NOTICE here that there's a different command button on Page2? on Page1 the command button is "Command8" on Page2 it's "Command3"! >> TAKE NOTE HERE, even though you copy and pasted - the controls are not the same, they have different names! 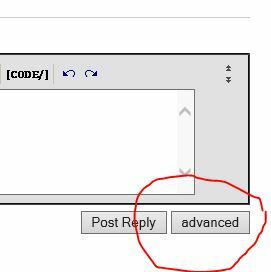 So in this case when you click on the command button on the form with the caption "Command9" you will get a message box; HOWEVER, you will not get that same message box on the control pasted on the "Page2" of the tab control... you will have to go into the properties for the command button on Page2 and set the code up for the event! Attached is a database that I pulled the above images from and should make the rest of this very obvious to you. I was hoping that someone could provide a definitive article on the parts of a form, and your picture is an excellent start. I know that you said you would investigate, but even if you can't find an appropriate website, a few illustrations of that calibre would be perfect. Is there a question I haven't answered yet? At this point, read my last post(s), download the example DB, and let us know if you've figured the first part of your question out. At this point either we are not explaining things in a manner that you can understand or your question was DOA when posted. Not sure why you marked my post as the answer seeing as how it's not an answer, just a rewording of your question. 1)I have navigation tabs on the first tab and it controls all the records on these tabs (pages). I want the navigation tabs to work only in tabs 1 and 2 but a second navigation tab to work on tabs, 3 and 4. (It can be the same navigation tab and works the same way but when the first navigation tabe moves, the records in Tab (page 3 and 4 ) doesn't move. If I go to Tab (or Page 3) the records in Tab (page 1 and 2) doesn't change. Is this the way you want it or the way it is right now? Either way, because you are talking about Records in the Tab Control, there is no way to do what you are wanting to do without changing the structure of your form and using Sub-Forms which are not linked in a Parent-Child relationship with the main Form. We have said this before. It does not appear you are using Sub-Forms within your Tab Control Pages, but the data is simply in Text Boxes on those Pages. It is impossible to move to part of one record on one page and another part of another record on another page without the use of Sub-Forms. All my records in the dtabase are one one page. I am not trying to change anything in the records apart from deleting the record when it is not in need. Yes, if you delete the record on one Page, you will delete that same record from the other Pages as well. You must restructure your Tab Control and use Sub-Forms. I want things to work just as you say. When I delete or edit something, I want it to affect everything. That is not how your original post reads. Exactly what is it that you are trying to do. Please--do not simply restate the same things you have said many times before, as apparently we are not quite grasping it. This is what I hear: You want to navigate to different records on Pages 1 and 2 of your Tab Control using Navigation Command Buttons that you have put on your Tab Control on Page 1. 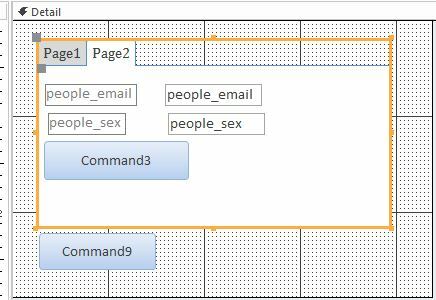 You want a different set of Navigation Command Buttons on Page 3 (or 4) of your Tab Control that navigate the records only on Pages 3 and 4. We have grasped all that. However, you can't have it both ways. You can't delete a record that is being displayed on all four Pages, yet still navigate to different records at the same time. Please help clarify this for us, as we are thoroughly confused. ok. thanks. I will rethink about it. What about if I use the same command button? Will it be the same result? Moving to a different record is moving to a different record. You can have twelve Command Buttons, but if they change the record, the entire record of the Form will change--unless you completely restructure your Form. 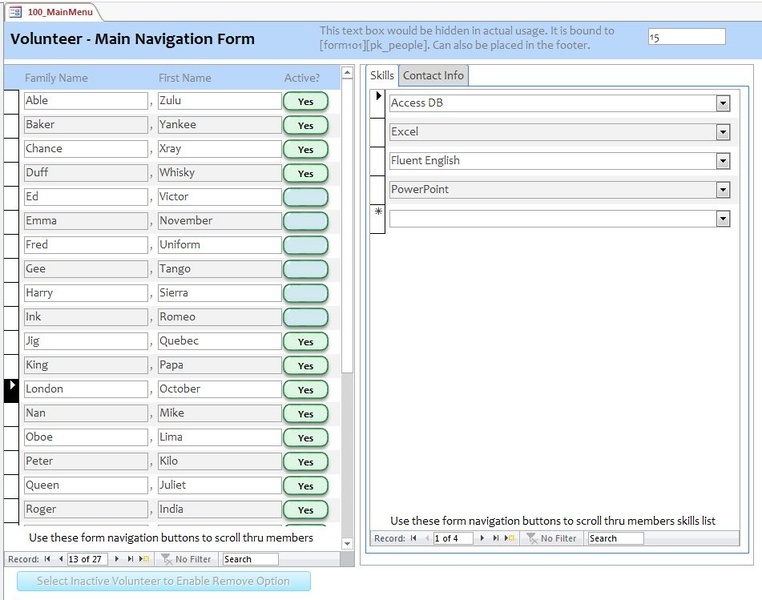 Now if you use ANY method of record navigation, doesn't matter if it's a custom command button or the default form record navigation (see here) ALL of the information will change on the main form and ALL of the TabControl Pages. There is simply, absolutely, no way around this behavior on a bound form - period, dead stop. IF you have an unbound form with an unbound TabControl then we have a new situation wherein you can setup subforms which could allow you to navigate records between forms independently; however, I do not recommend this method for people that are not extremely proficient in Access (or for that fact any database) and it doesn't sound to me as this is what you are doing. 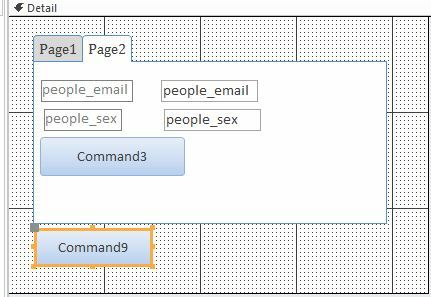 on Tab-Pages 3 and 4 you want command buttons that will step thru the listboxes on those pages. You simply MUST start using the standard names for the controls on the forms or no-one is going to be able to help you and not doing so after several requests show a certain lack of respect on your part towards those that are attempting to help. I reset my answer because clearly it isn't the answer. I'm just as confused as everyone else, I have no idea what is going on or what it is you want to do. You should attach screenshots of what you have and mockups of what you want to do. Any help please. I am adding a subform to my database but I need help as to what I should remove from my original database and put in there that will help my problem of navigation controls on Tab-Pages 1 and 2 etc, and command buttons that will step thru the listboxes on Tab-Pages 1 and 3. I still think you are going to have to give us more information on this one. Why would you need Command Buttons to step through list boxes? And, how is this tab control and its pages going to be related to your main form. The more information you can give us the better. We have spent more than 40 posts trying to figure out that you couldn’t do what it was that you originally wanted to do and now we have to figure out a more complex solution—again, without much information on anything. Please provide as much detail about your form and exactly what it is that you want to do. 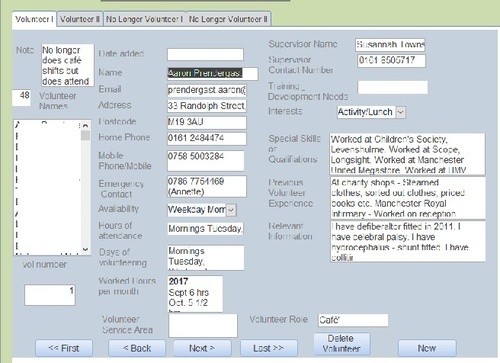 1:Listbox to be able to select volunteers or use command buttons to browse through voluntees. If No longer volumnteer admin can remove the person to no longer volunteers page when this person decides he/she doesn't want to do this anymore..
5: Why they decide to quit, admins can be able to delete volunteers. 1. Just like first 2 pages. 2.listbox like in third page like on first page. 4.No longer volumnteers Yes/No does not show here. Members not authorised to edit and change details shouldn't. Ok, this is a standard membership type database - that makes sense. A tab-control makes a lot of sense here in that by using the standard form-record-navigation controls you can display information in logical groupings. What I gather you want to do with a standard bound form and a standard tab-control simply isn't reasonably possible. I've ran out of time for right now; however, this afternoon/evening (CST) I'll upload a simple example database showing how this can all be setup. This is really just a re-hash of the previous explanation and really doesn't help. As for Administrator verses Non-Administrator privileges to delete a member from the database... that's a whole other topic in and of itself and covered many times in other threads. 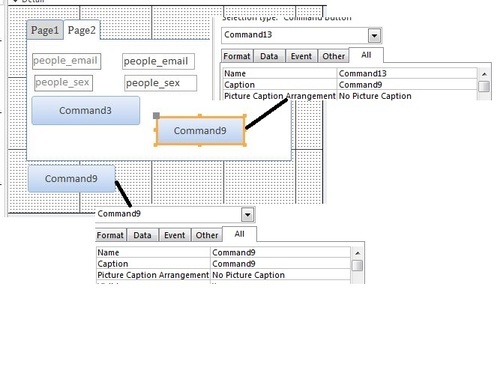 For a rather involved but very effective means for accomplishing this, please refer to this Article about User Permissions and Customized Menus in MS Access. Hi, there are lots of stuff going on here and don't even know where to start from my old database, attaching te Sub-Forms. I don't even now what help the Sub-Forms will do. One of the reasons that there is a lot going on in this thread is because you've been very unclear with your goals; however, I think I now have an idea where you are going with this so as promised in post#45 the data base. - You have to hand enter the values for the linking fields, you cannot use the [...] button you will receive an error about unbound forms. The toggle button is something I've used in anther database. When the recordsource is True (-1) then you can see the text, when false the text is hidden - all without VBA! It's a trick with the formatting. Other than the toggle button, nothing really fancy here. Code behind all of the updating and linking is all at the form level. Really shouldn't be anything too exciting there other than the code to check that the parent form is loaded. Hopefully this is all fairly intuitive. and here's with page2 of the tab_control which shows the details of the related record selected on left. 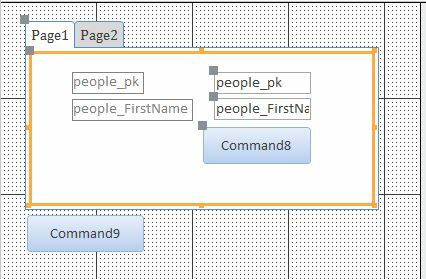 Hi , On the Sub-Forms I have attached to the form, should I the table with all the fields? I spent i5 minutes creating a very basic form – it’s ugly, has not been formatted, but works very simply. user access to only certain pages through session variable?